Sit opposite each other to draw your portraits and then switch the book around to add hilarious details, cut out funny googly eyes and make each other laugh, or race to see who can complete the dot to dot first. 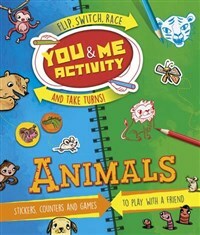 This brand-new series brings friends and siblings together with amazing activities that need to be completed as a pair. The activities will boost your creativity and friendship as you work your way from one entertaining spread to the next. Designed to be flipped around and played with from every angle, each book is perfect for energetic kids to spend time together. Whether friends, siblings or even with a parent, this fantastic activity book series is bound to get you roaring with laughter. Moira Butterfield has a huge list of children's books including a number of internationally-successful titles spanning non-fiction and fiction for all ages up to 11. She has been highly-commended by the US Library of Congress for her work. and her books have featured on the national UK school curriculum. She has written a number of art and craft books for children and run craft workshops at National book festivals.